After too many ramen noodles, a recently-earned college degree, I decide that a summer in Mexico might be what I need to get away and re-connect with friends, family, and myself. The self who abandons the pre-packaged Caesar wraps in his refrigerator for the full roasted pig and the freshly-cut cilantro of Mexico City. The self who is nourished not just by the food of his father’s country, but by its history and culture. In Mexico City, I find myself walking alone – slowly – at ten o’clock at night. I can hear my own dress shoes click on the cobblestone street with each step I take. I can feel a permanent slouch in my back – one that I could never correct throughout the academic year. I am to meet up with my cousin, who I haven’t seen since I was ten years old – the last time I was in Mexico. This might explain why I’m so shy and nervous. I’m also hungry. It is so dark that I can’t see beyond the car driving past me on the one-way street. I’m supposed to find the bright taco place on the corner called El Farolito, little streetlight. 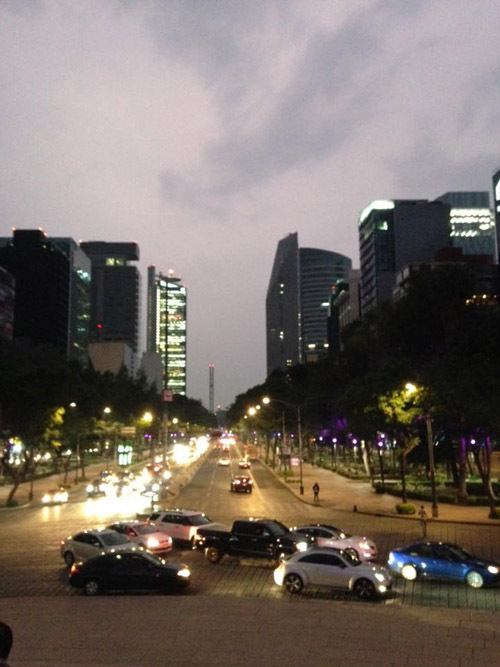 I continue to walk until I see a bright light on the corner of Alfonso Reyes and Tacámbaro. I see people across the street. They’re also headed toward the taquería. I run into a green streetlight that illuminates the entire corner. In front of it, EL FAROLITO is written in bright letters. The fluorescent light and the smell of spicy meat draws people inside. Looking through the window, I see a trompo of red marinated pork meat spinning and shedding its juices over a bright fire. I am overwhelmed by the smell of pineapple. I see Alma, my energetic forty-year-old cousin, waiting for me. She’s a pre-school teacher, a proud feminist, and a soccer mom who wears bright red lipstick. She sits with her legs crossed at the granite counter. My mother calls her la bola de la fiesta; her name means soul. At the community bailes folklóricos, she dances to “Jarabe Tapatío” with the viejitos in their wheelchairs and drinks entire flights of tequila shots faster than the men. She’s a part of a once all-male mariachi band. I’ve heard that she can silence a room with her powerful rendition of “Volver” while wearing her cream-colored sombrero. A sombrero large enough to provide cover for her family in the rain. Out of everyone, I remember her to be the most outgoing. A long-distance family member who makes me feel not so long distance. I know that she’s mastered the friendly shove and the Spanish pun like ¿Cómo se llama el pez más negativo? ¡Pesimista! And so, in my bashfulness, before heading to Mexico City, I messaged her. She greets me by picking me up and squeezing me tight (and unintentionally cracking my back into shape again) before inviting me to sit next to her. She’s a petite woman, so, I’m surprised that she managed to pick me up from the ground. I see eight men and women with black chef hats preparing dozens of tacos – one of them witnessing how Alma just greeted me, distracted and marveling at her physical capabilities. One of the chefs is focused, carefully shaving roasted pig meat off the spinning trompo. I can feel the warmth of the fire. “Dos coronas con sal y limón!” Alma orders, throwing her hair back and slapping the table with her right hand, causing the distracted chef to jump a little as he places corn tortillas on the grill. I smile and think about the thousands of hand cells that she just killed. I then stare at the burning fire. The fire with charcoal casts its energy over a meat that spins in its juices. Al Pastor, a nod to the original Middle-Eastern lamb rotisserie, was brought to Mexico by Christian Lebanese immigrants in the 19th and early 20th centuries. After the fall of the Ottoman Empire, around 36,000 immigrants arrived in Mexico from the Beirut region on French ships. In the 1930s, Mexican-born children of Lebanese parents began to open small restaurants that brought together Lebanese-influenced ways of cooking with Mexican spices while also replacing lamb and beef with pork. Pork was more common in Mexico. The final touch was the traditional flatbread of Lebanon replaced with the corn tortilla. Taquerías, with al pastor meat, began in small rural towns and later expanded to larger cities due to industrialization. The original shawarma (sliced rotisserie meat on flatbread), however, did not lose its popularity in Mexico. If I replace a tortilla with flatbread, the plate returns to its original form – which, in Mexico, is tacos árabes. The chef cuts the pork in thick layers and tops it with red chile salsa to add color and a biting flavor. He carefully places each layer of marinated pork on the vertical spin and adds a chunk of pineapple at the top for an extra dose of flavor in each taco. There are a few theories as to the etymology of the word taco. Some say that it comes from the Nahuatl word tlahco meaning half or in the middle. Food that is placed in the middle of a tlaxcaloa– the Nahuatl word for corn tortilla – would reflect a tlahco. Another group insists that the word taco comes from the Spanish word atacar meaning to attack. Others claim that Mexican silver miners, in the 19th century, used explosive charges filled with gunpowder in plug form made of paper wrapper. The silver miners called the explosive charges tacos. The food reminded the silver miners of their work because of its small, round-like size. It became associated with dynamite. Alma hands me a cold bottle full of beer. She squeezes the lime into it, eventually throwing it all in, and adds multiple pinches of salt. “Órale,” she says. “Pa’ que te calientes!” I add a little pinch of salt and slowly squeeze my green lime into the bottle. “Bueno, ya está!” she exclaims, lifting her bottle of corona up to the ceiling. She signals for me to do the same, swings her hair back again, and exclaims, “Arriba. Abajo. Al centro y pa’ dentro!” This is an expression that I’ve heard before. It is the soulful way of toasting in Mexico. A gesture full of life. In Mexico, many believe that the first drink of any type of alcohol sets the tone for the rest of the swigs. If the first drink isn’t full of audacity and fearlessness, drinking a beer might turn out to be más o menos. And más o menos isn’t enough. I see Alma grab her beer as if she’s going to attack it. I can imagine a scenario where it shatters in her hand even before she gets her first drink in. I’m afraid for the Corona. Following her lead, I grip my beer, hold it up to the ceiling, arriba, bring the bottle down, abajo, move it out to the center, al centro, and bring it in, y pa’dentro! The bitterness of the light beer, combined with the salt and lime, runs down my throat. I don’t even notice Alma ordering. Maybe the chef already knows her. He places a purple plate in front of me with three gold corn tortillas that emit steam with a scoop of al pastor meat on each tortilla. Putting his fist into the air, he looks straight at me, urging me to eat. The plate resembles a night sky with little stars on it. Before I can ask for pineapple and lime, he places five molcajetes in front of us filled with crushed pineapple, diced onion, chopped cilantro, brown salsa with crushed pepper chunks the size of my fingertips, and limes the size of ping-pong balls sliced into halves. “¡No es fácil ser mexicana y guapa!” Alma exclaims. “Pero uno se acostumbra.” We laugh, and she invites me to eat, while scooping up the spicy brown salsa to pour over her own tacos. The three tacos sit on my plate waiting to be eaten. I’m not sure what it is about them, but they have a distinct quality that I’ve not seen in the U.S. I wonder if it’s the bright shade of red on the meat. It looks brighter than any taco I’ve seen before. A hot Cheeto kind of red. It looks spicier. The cilantro has the green of a three-leaf clover. The crushed pineapple in the molcajete has a bright yellow color. Again, Alma signals for me to eat. She points at the salsa, encouraging me to pile it on. As Lebanese and Mexican cuisine joined together to become a hybrid, food consumers could not forget about spicy salsa. Salsa can be traced back to the indigenous Mayan, Aztec, and Inca. Tomatoes and chile were a part of the land. The Aztec lords would smash squash seeds together with tomatoes and chile for flavor. When eating tacos, I’ve learned, it’s important to choose the correct salsa, not just any salsa. To add the right salsa with the right meat over the right tortilla means that I can achieve a fusion of flavors at its maximum quality. There are three main types of Mexican salsas: chile-based, roasted, and tomatillo. Chile-based salsas come from dried chiles like guajillo and pasilla. These salsas create a thick texture with a sweet and pungent flavor. Tomatillo salsa began with the indigenous peoples, who would make it to achieve a distinct citrusy flavor. My parents make tomatillo salsas by roasting green tomatoes and chile for a smoky flavor. And then there’s the level of spice. Roasted and tomatillo salsas are usually made with one of five types of chile (or even more if one is so daring): Poblano, Jalapeño, Serrano, Árbol, and Habanero. Each type of chile differs by Scoville Heat Units (SHU) – the official measurement system of heat for chile peppers. I stare at the brown salsa and the little pepper seeds floating inside. I’m determined not to be defeated by stupid Scoville Heat Units. I’ve seen my father blend ghost peppers from India into a salsa while wearing extra thick gloves and a surgical mask over his face, a whopping average of one million SHUs per ghost pepper. I grab the spoon and splash two scoops of salsa on each taco. As I bite into my first taco with all the ganas that Alma just told me to exert, I can’t help but feel the hundreds of thousands of Scoville Heat Units sizzling on my tongue. It’s natural to taste what’s on top of the taco first. I keep my mouth closed, determined not to go for the water or, better yet, some stranger’s pineapple agua fresca. The taste of sweet pineapple and onion begin to mix in with the salsa as I chew. They complement the spicy taste. The green cilantro and lime bring a zesty flavor. The chef places a pile of Oaxacan Cheese on the grill. As the cheese bubbles, he slices a few nopales with a large knife sharp enough to part a cow’s thigh in half. He places a blue corn tortilla over the cheese and the nopales, letting the ingredients grill for a couple of minutes. The corn tortilla is considered a staple food in many North American and Central American cultures, my house included. Mexico, for example, grows more than forty-two different types of maize, which come in multiple colors: white, yellow, red, and bluish purple. A corn tortilla is made by grinding the maize together after curing it in limewater, which causes the skin of corn kernels to peel off easily through a process called nixtamalización. Placing the maize in an alkaline solution of mineral lime or calcium hydroxide enriches the nutritional value of the corn by releasing vitamins (Vitamin B especially), minerals and protein. The limewater contributes its own calcium, making the corn easily digestible. The indigenous populations of Mexico and Guatemala discovered this process without studying Organic Chemistry. The nopal is one of the most consumed foods within Mexico. It is cultivated all over the country. The pencas form new plants after falling to the ground. The nopal tree is often referred to as la planta de la vida, hinting at the life-rebirth cycle that it is often associated with it in most ancient Mexican myths. Of course, the danger of nopales are the thorns. For the indigenous people of Mexico, however, the thorns were simply an obstacle that needed to be overcome. To prepare nopales, pick the pencas that are light green for the best taste. Then remove the thorns by cutting them at the base, away from you of course. Afterwards, place the nopales over a grill and eat them whole. Or cut them into pieces for an ensalada de nopal or a quesadilla – a nopaldilla. The quesadilla was invented during the colonial period of Mexico. Cheese was unknown before the Spanish conquest. Queso Oaxaca, named after the Southern state of Mexico, is often used for quesadillas due to its light string cheese texture like unaged Monterey Jack. The string cheese process, which originated in Italy and was used to produce Mozzarella, was brought to Mexico by Dominican monks who settled in Oaxaca. The cheese is flexible. It can stretch and roll up like a string ball. The chef slides the spatula underneath the melted cheese and grilled nopales, flipping the entire quesadilla over. He folds the heated blue corn tortilla into a half moon shape. He flips the entire quesadilla into the air and onto the plate, and hands it to Alma. “Ten,” she says, offering me half of the quesadilla. Inside it, soft pieces of cooked green nopales are embedded in a pool of melted cheese from Oaxaca. Outside, the white cheese oozes over the dark tortilla. After dinner, we both are full and I’m ready to see the city. To connect with a place, I can tell is full of life. Alma offers me a ride to the nearest metro stop. Lowering all four windows of her car, she invites the smog of the city in. A smell of cigarettes and gasoline. Alma turns up the music to “Pégate” by Ricky Martin and presses down on the gas pedal. I wonder how her sound system has stayed intact for so long. Her car’s probably afraid of her. I hear the drums first – 1, 2, 1, 2, 3…1, 2, 1, 2, 3 – and then the base, the guitar, the tambourine, the saxophone. The trumpet joins in last. Alma plays the drums on the steering wheel while salsa dancing in her seat. And like her, I’m encouraged to move my head back and forth – just a little – to the rhythm of the beat. Driving on Paseo de la Reforma, I see the golden statue – el Ángel de Independencia – lit up in purple colors. Surrounded by four eagles, she stands tall, holding a laurel crown in her right hand and a broken three-link chain in the other. The chain symbolizes three centuries of Spanish rule before Mexicans declared and fought for their independence. 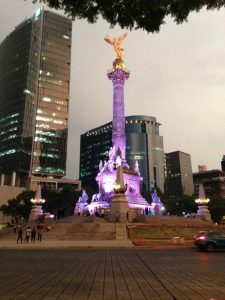 The monument was constructed in 1910 during the Porfirio Díaz era. In the middle of heavy traffic, she pulls over to the side of the road directly in front of the monument and next to the metro, my mode of transportation. Breaking away with my shyness, I unbuckle myself and open the car door. I can hear thunder roaring in the gray skies. Hundreds of cars zoom by on the roundabout. To cross by dodging traffic is sometimes a must. 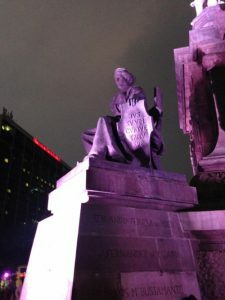 A young woman covered in glitter with her hair pinned up and wearing a puffed-up purple dress, runs through traffic to get to the Angel of Independence. I assume she is celebrating her quinceañera, which, in Mexican culture, is the peak ceremony for a young woman’s transition from childhood into adulthood. Wearing high heels and gripping her dress, the young woman runs at full speed, dodging the cars that honk at her. She screams at the top of her lungs declaring her independence. Eight young men in black tuxedos and six teenage girls in lavender dresses run after her, almost rhythmically. Without a care in the world, I too run as fast as I can, cruzando mal. I dodge the traffic that comes my way. I can hear at least ten cars honking at me. As I run, I yell at maximum volume, feeling every single pitch and tone in my own voice. Feeling rain drops on my head, I finally get to the marble steps of the monument. The purple lights spring up from the bottom, warming my face amid the cold drizzle. I begin to make my way up the steps. Arriving at the top, I stop and look up for a moment to the angel of victory, while the gray skies illuminate the city of skyscrapers. I sit, looking out into the unknown distance, remembering that the night is young. I can still hear the drums of “Pégate” in my head. I am almost blinded by the headlights of the hundreds of cars that make their way around the rotonda – some with their windows open, blasting music. I sit and take a deep breath, listening to the sounds around me. And I see los farolitos flickering, casting their light nearby, showering me with energy.